Liberty Ranch High School works to ensure that all entering students have access to information about the school when the students are in 8th grade. designed for them to see what they should expect during high school and what our school has to offer. At this event each department showcases their specific program. At registration, students receive a one on one meeting to examine course offerings. Due to significant state budget reductions, our counselors will no longer be registering students in the evening, instead attend registration days at the feeder schools during their regular day. At these meetings, the staff has access to the students current grades in Math and English and teacher recommendations. During the Freshmen year, counselors once again meet with the students for a presentation entitled “Reality Check”. This multimedia presentation is intended to help students envision their future goals and identify how their education will help them achieve these goals. At this time the students map out the next two years on the “4 Year Plan” document. 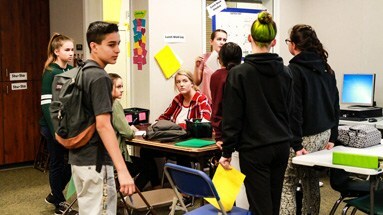 During their Sophomore year, each student and their parents have the opportunity to meet with a counselor during “Sophomore Counseling’ meetings in the late afternoon and early evening. Liberty Ranch High School provides after school homework assistance from 3:15 p.m. to 5:15 p.m. on Monday, Tuesday and Thursday. Students may drop in and receive support/assistance in mathematics and language arts. Currently our ELA tutor is utilizing the computer lab to assist students in writing essays. Liberty Ranch High School‘s academic departments use state standards and frameworks to determine curricular content. Instructional strategies and assessments are developed to support attainment of standards and the Expected School Wide Learning Results. Each teacher uses a variety of instructional strategies that encourages the active involvement of each student. Students are encouraged to develop techniques to organize, access and apply knowledge. Most of the teachers at Liberty Ranch have received training on the theories of the International Center for Leadership in Education (ICLE), with many teachers attending conferences and workshops sponsored by ICLE or their Successful Practices Network (SPN). With this training, teachers are consistently reviewing their activities to determine where they stand on the “Rigor/Relevance Framework” and make adjustments accordingly. During the evaluation process, teachers are required to outline an entire unit with special care in determining what quadrant their lessons fall into. We have had three “cohorts” of teachers, total 28 teachers, and all 4 administrators attend a series of “Elements of Effective Instruction” workshops presented by Dr. Ernest Stachowski. All 4 administrators have also participated in an additional workshop on “Focus Walks” to observe and support implementation of the EEI training. Currently a representative from English, Math, Social Science, Science, And Agriculture are attending Performances Fact’s Eye on the Goal training for data analysis. Collaboration time is provided to teachers to review the results of common assessments and based on those results modify their lessons for better results. These structured collegial discussions have proved valuable in making improvements in content and teaching methodology. departments have common PowerPoint presentations that are shared for consistency. Liberty Ranch High School hosts its’ annual Back to School Night in August and its’ annual Open House in March. Parents of incoming freshmen are invited to our Building the Bridges to High School/Department Showcase presentation, as well as a one-on-one course selection session for their student during the registration process. Liberty Ranch High School presents an evening “Department Showcase” event for incoming students and parents after the Bridges presentation and before the course selection evenings. At this event, parents view presentations and demonstrations by each department and are able to ask questions and interact with teachers to learn about the many programs offered at Liberty Ranch High School. Parents also can speak to our Athletic Director, Activities Director, and School Counselors. Parents of athletes are invited to attend Fall, Winter and/or Spring Sports meetings to learn about expectations for athletes for behavior, to maintain eligibility, and NCAA requirements. Liberty Ranch High School, partnering with its’ sister school Galt High, also invites parents of students experiencing academic or behavioral problems to attend Parent/Teen Project classes. The Parent/Teen Project is a 10 week series for parents assisting them in dealing with difficult behaviors. Staff each year makes recommendations to the Parent/Teen Project team for families to invite. The classes are offered in English and Spanish and are taught by trained facilitators. Parents are kept informed of current events, programs and students’ progress in a variety of ways, including PowerSchool, Canvas, a school website, school marquee, newsletters, teacher emails, attendance calls, automated phone dialer, and regular student progress reports. In addition, parents may request parent/teacher conferences through the Counseling Department as necessary. There is a full-time District Translator to assist with Spanish language needs for all written communication(s). 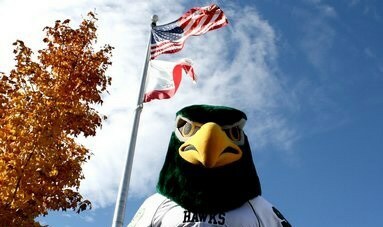 It is the goal of Liberty Ranch High to assist students in their social and personal development as well as academics. The school gives special attention to students who experience achievement problems, difficulty coping with personal and family problems, trouble with decision making, or handling peer pressure. Liberty Ranch High School greatly benefits from its supportive parents who take an active interest in the daily activities of LRHS. The school has a strong base of parent volunteers who participate in our School Site Council and English Learners Advisory Council. Parents are also welcome to join the LRHS Parent, Teacher, Student Association. The school also benefits from several community partnerships including Athletic Boosters, Galt Liberty Unified Ensemble boosters, AG Boosters, AVID Advisory, AG Advisory, and GATE Advisory. LRHS also has community partnerships with D2 Trailer Sales, Silva Ranches, Greendale Dairy, Pearson’s Concrete, and Rausser Bros. Trucking.